After carefully considering all the wonderful entries in the 7th Annual Iowahawk Earth Week Cruise-In, it's time for me to recognize who went above and beyond the call of carbon duty and earned immortality in our Hall of Champions. Let me thank the over 100 entrants this year, from 4 continents, who once again made this my favorite blogging tradition. Everyone was special in its own way, but unfortunately only one can wear the crown as Grand Champion Carbonator. Congratulations to this erstwhile "public-private partnership" for showing the rest of us how to isolate energy waste... then supersize it! So what merited the award? Let's review. Our first co-titleist, Solyndra, slapped together a solar panel "green jobs" scam, blew through $535 million in cash, then headed for greener pastures as soon as the sun went down. The patsies in this clever stripmining operation: the American taxpayers, who were left holding a bag containing a few lint balls and photovoltaic magic beans. More prescient investors (the ones with the foresight to contribute to the President's election campaign) got dibs on the carcass. And what a handsome carcass it is! 400,000+ square feet of high-tech ultramodern Ozymandian emptiness, featuring luxury conference areas and marbled executive restrooms. Best yet - 22 megawatts of electrical capacity powered by... diesel generators! Like Seinfeld, a hilarious show about nothing. 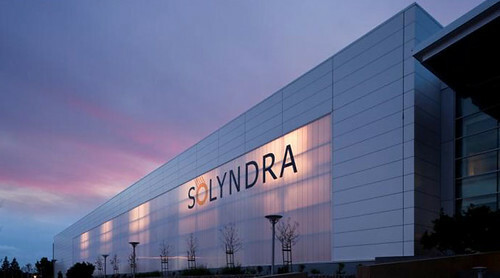 Well done, Solyndra, well done! And let's not forget our other co-titleist: the United States Department of Energy. If not for the support and loan guarantees of Washington DC's craziest venture capitalists (led by Nobel-certified braniac Steven Chu) Solyndra might have died in the crib before revolutionizing Northern California's unsellable commercial real estate market. But that supporting role not the only reason for their selection to our Olympus of Carbon. The DOE is ready for their star turn as well: this humble federal department, in charge of hectoring Americans for their energy use, maintains its own fleet of 15,108 vehicles - for a workforce of 15,000 employees. Now that's what I call a company car kinda company! Take a bow - and get a room, you two!